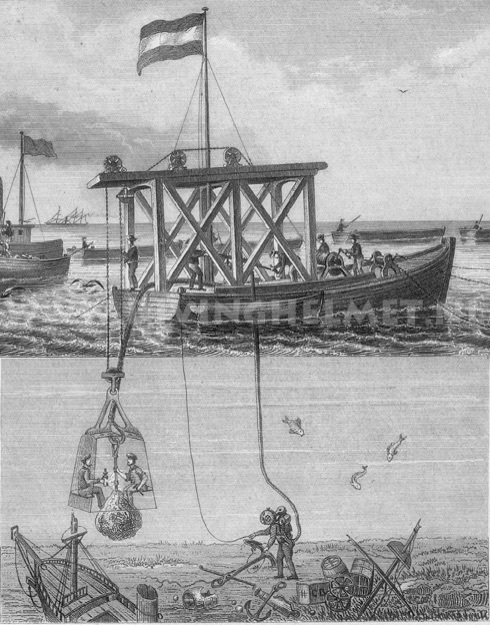 In 1845 Hugh Morton sold another diving bell identical to the one which he sold to the Dutch government to the town of Hamburg in Germany. This German bell is shown in the engraving. An interesting detail here is that the illustrator has drawn an air-pump which seems to supply air to both the diving bell and the ‘Denayrouze’ type diving apparatus. (See the ‘Denayrouze ‘chapter for further information about that equipment).